The latest #Classic Programme review sees us travel back in time some twenty two years, to a Spring day in Hampshire.Some brutal honesty here straight off the bat – my sense of humour isn’t particularly cultured or cerebral. Case in point: the words Chipping Sodbury appear numerous times within the slender programme for this Beazer Homes League Midland Division clash and not once did it fail to raise a smile. Chipping Sodbury. It’s not really the name of a place but instead the words your dad used to seethe between gritted teeth upon stubbing his toe (after the divorce he stopped restraining his expletives behind quaint turns of phrase and he grew that funny mustache and cried a lot more too but this isn’t really the place for all that). Chipping Sodbury. It’s still funny to me now, typing the words out. Chipping Bloody Sodbury. It’s in the advertisements they mostly appear. The Squire Inn, for example, is found on Broad Street in Chipping Sodbury and has a skittle alley and I really have no idea what a skittle alley is but imagine it as the weedy, asthmatic cousin of bowling that even in 1993 wasn’t considered cool to partake in. Or at M.E. 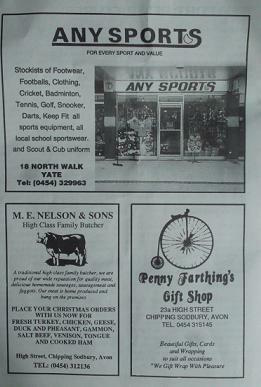 Nelson & Sons butchers on the high street of Chipping Sodbury and with their rather suspicious promise of “home produced meat” and extremely premature request for Christmas orders in mid April. Or even J Hollister of 76a Station Road Chipping Sodbury who had his thumbs in numerous unappealing pies such as “calor gas”, “heater hire”, “clima ladders”, “fishing tackle”, and “timber” as if he was the Toys R Us of random masculine items. The programme opens with “Towns Talk” which boredly relays to us recent events (sample quote – “Terry Stevenson sustained his serious knee injury in that match, and has not played since”) including the victory of the Yate Town A team in winning the G.F.A Intermediate Cup against Olveston United in a 4-1 victory which you would think would be cause for celebration except the particularly pessimistic author of the column prefers to focus on the reserve squad beating Almondsbury with two goals from Darin Hunt who, however, also missed two penalties which, had they been converted, would have made the event “considerably less nail biting for those who were here”. The utter arse. On the opposite page we are treated to a list of Yate Town’s club honours which bizarrely includes being finalists of the unappealingly sponsored ‘Hellenic Skol Cup’ (later on in an advert for IND Coope Sales, Skol is described as having a “crisp clean flavour” which is certainly an eventful way of saying “wholeheartedly bland”) and goes on to happily list all the times they didn’t quite win an array of competitions including the Hellenic Division One, Stroud Charity Cup Section A, and Challenge Trophy. One in the eye for those who subscribe to the “History only remembers the winners” maxim. 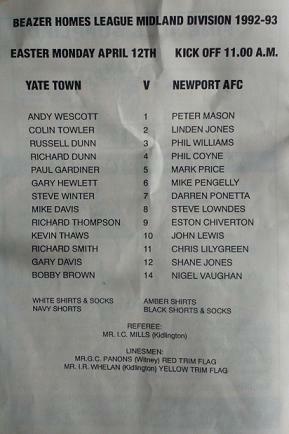 The Yate Town programme remembers EVERYTHING. Later on there is a description of the recent G.F.A. Senior Challenge Cup Final and an apparently exciting game during which Yate took a two goal lead before throwing it all away and eventually losing 3-2, due in part to a “termendous” save by the Gloucester keeper to deny an equaliser. The disappointment of this snatching-defeat-from-the-jaws-of-victory is tempered, apparently, due to the “knowledge that we had taken part in an excellent final” and, also, one which “drew praise from the Gloucester City contingent.” Fans of a team praising a match in which their team won a trophy? Who’d have thunk it? At least Yate had another event to add to the ‘Oooooh nearly’ column of their Honours section. Following the description of that match is a “point of interest” that the GFA Coaching Secretary Jock Gault won a basket of fruit in a raffle which he donated to an Old Peoples Residence which determinedly misunderstands the term ‘point of interest’ and re-imagines it as ‘thing that happened that most likely nobody cares about’. Top work. A recurring theme throughout is a sense of anger towards the Welsh Football Association in defence of the visitors Newport. At the time that this match was about to take place Newport AFC were still a relatively newly formed club, created in reaction to the winding up of Newport County who, little over a decade earlier, were winning the Welsh Cup and taking part in a famous European Cup Winner’s Cup run. It was American “economic idiot” Jerry Sherman who owned the club at the time of their demise, and who famously announced following the winding up order that “We have to get a league to play in, a park to play in – you know, little things like that, but we’ll sort something out.” with a seemingly straight, oblivious face. They didn’t sort something out and Sherman was later jailed for fraud. Newport AFC was born in June of 1989 and by this, the fourth season of their existence, the Welsh governing body had exiled them to play their home games outside of Wales as a way of promoting their own newly formed League of Wales. This meant Newport had to play their games at Moreton-in-Marsh, a Gloucestershire town 80 miles away and meant the away fans would have less distance to travel for this match at Yate than they would to watch their team at ‘home’. During the Newport Pen Pictures section the entry on Darren Porretta lambasts the “attitude of the Welsh F.A.” (also worthy of note is that Tony Pulis’ brother Ray was in the squad for this game) and later on in the article recounting their oppositions history they speak of “what has been a constant battle” since the club was formed and of the obstacles that lay ahead. 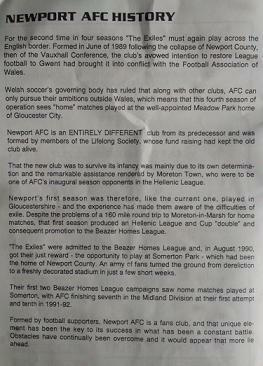 Happily, as we now know, twenty years on from this game Newport A.F.C. finally returned to the Football League and currently inhabit League Two. According to the Yate Town line-up that day, and alongside such Generic Male Random Name Generator creations as Mike Davis, Steve Winter, and Richard Smith, wife-beating pop disgrace Bobby Brown appeared as their number 14. Bobby Brown, you say? Turning out in an amateur football match for a side located within the region of Chipping Sodbury? Well. He doesn’t need permission. He makes his own decisions. Posted on August 5, 2015, in Kieran's Classic Programmes and tagged Featured, Newport AFC, Yate Town. Bookmark the permalink. Comments Off on Yate Town F.C. vs Newport A.F.C. (Beazer Homes League Midland Division 12/04/93).